Davam Urgent Care family clinic located in Magnolia, TX offers a wide range of urgent care medical services for the whole family. At our family clinic in Magnolia, TX, each patient will always be treated by a board- certified medical provider. We are able to treat a wide variety of illnesses during our convenient daily hours of 8am-9pm. Families will always receive a five star customer service experience and the best medical care possible at Davam Urgent Care. In addition to treating a wide variety of illnesses, our family clinic in Magnolia, TX offers many other services. This includes EKGs, sports physicals, school physicals, on-site digital x-ray, drug screening, and an on-site lab to allow for quick results for the whole family. Most major insurance carriers are accepted along with affordable prompt pay pricing and an in-house medical membership plan. For more information on insurance and prompt pay pricing, please visit www.davam.com/insurance or call our in-house billing office at (713) 487-3030. 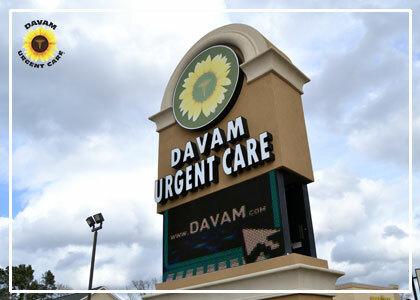 For more information on Davam Urgent Care please contact the clinic directly at (281) 583-1980 or visit our location at 6022 FM 1488 Magnolia, TX 77354. Our family clinic services the Magnolia, TX neighborhoods of Westwood North, High Meadow Ranch, West Alden Bridge, Lake Windcrest, Sendera Lake Estates, Montgomery Trace, Inverness Crossing, May Valley, Westwood, Mostyn Manor, Cimarron Country, Cimarron Creek, High Meadow Ranch, Bear Branch Estates, and the Magnolia zip codes of 77353, 77354, and 77355.